Lorrane “Lory” started her EMS career in Sioux Falls in 1994. Since that time, Lory has served as a Paramedic, Field Training Officer, Flight Paramedic and Field Supervisor. Lory has managed multiple areas of ambulance operations ranging from scheduling to supplies. 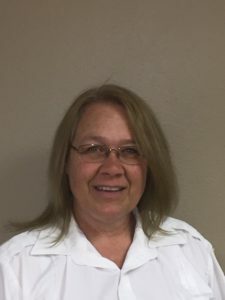 Over the years, Lory has served as the liaison to the rural Fire Department in the area, including currently serving as the peer coordinator for the CISM Team. In her spare time, Lory serves locally as a volunteer Firefighter and EMT for her local community of Valley Springs. Lory has faithfully served in her community since 1994. During this time, Lory’s dedication to her community has been fundamental to her success in EMS. Lory continually demonstrates the actions and values of an EMS professional, and is a role model to those around her. Whether volunteering as an EMT and Firefighter in Valley Springs or the serving as the peer coordinator of the local CISM Team, Lory can be found serving in her community long after her shift is over. Lory is well respected among the local volunteer services and she is a vital member of the Paramedics Plus Sioux Falls Family.